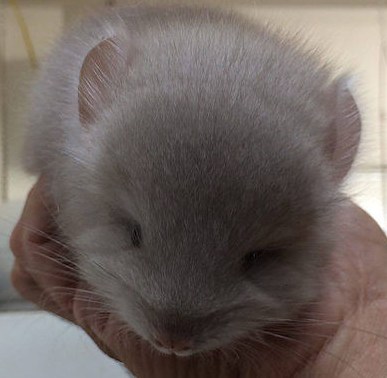 ​This color is the wild type coat color for chinchillas, as such, it is not dominant or recessive but what shows through when no mutations are present. Any color other than standard is a mutation because the color occurs from a mutation in the genetic code for coat color. 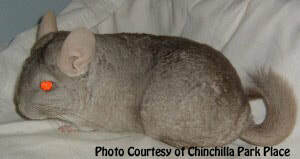 The chinchilla coat is an agouti pattern meaning that there are three layers to the fur pattern. 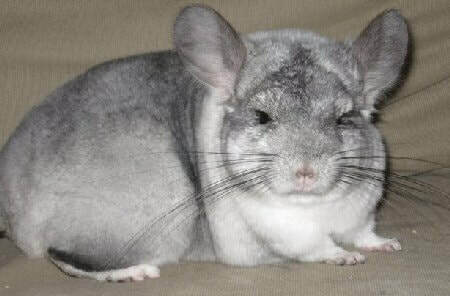 The three layers of the chinchilla's fur shaft are (starting from the base) the underfur which is grey, the bar in the middle which should be a clear and bright white color, and the tip of the fur which ranges from light grey to jet black. 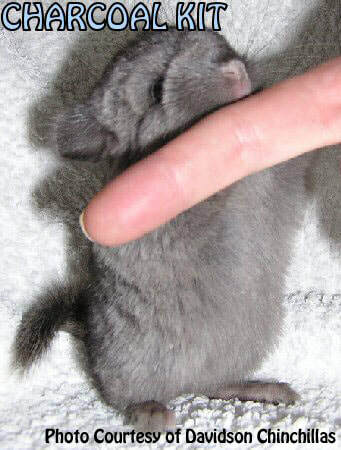 The tips of the fur, when combined across a chinchilla's body is called the veiling. The veiling will range from light grey to dark according to the coloring of the individual hairs' tipping. 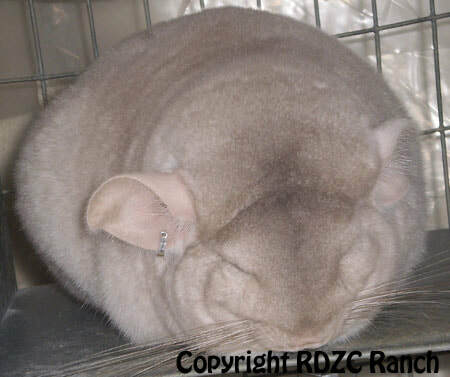 There is also what is known in the chinchilla world as the "grotzen". This part of the chinchillas coat is an exceptionally dark strip going straight down the spine from the nose to the base of the tail. 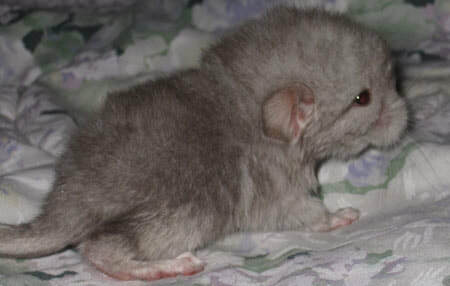 The grotzen is the starting line for the grey color which lightens as it goes down the chinchilla's sides, leading to a stark white belly. They typically have grey ears and darker eyes. 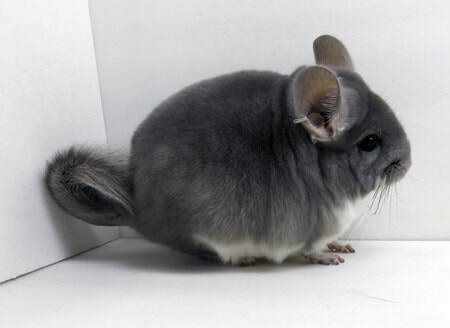 This color is a recessive mutation, so two sapphire genes are required to have the sapphire coloring show through in a chinchilla's coat. A carrier of this gene would appear as a regular standard grey color, but would be able to pass on the sapphire gene to its offspring. The coloring is described as a light "gun metal" blue. The "sapphire" name comes from this gun metal blue hue to their coat. Another distinct feature of the sapphire is their pink ears which can help distinguish them from standard greys, carriers and violets. The sapphire first appeared on a ranch in Indiana to a man named Merle Larsen in 1963. It was developed very carefully at first and some ranchers (including Diamond Blue and PSK Chinchilla Ranch) bred sapphires that regularly earned top of the table awards and ended up in the final race for Grand Show Champion. Today, the quality of the sapphire has deteriorated greatly due to overbreeding with no regard for quality. This mutation requires very special consideration and a very strong focus on the use of the highest quality standards to improve their faults. Several breeders are now working with this special mutation and making huge strides in improving the overall quality. These breeders include Jim Ritterspach, Kristy Morici, and Jordan Manalo (pictures of adults courtesy of Jordan). This mutation, like the sapphire mutation, is a recessive mutation. Many people when starting out will not be able to tell the difference between Violet, Sapphire, and standard so we have these three colors pictured close together for your reference. 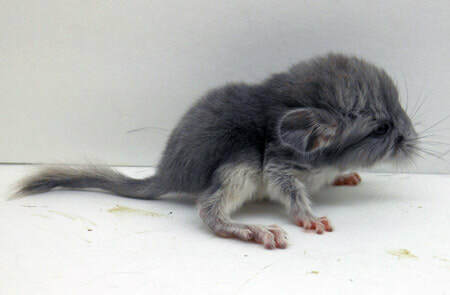 The violet has a light violet hue to its grey coat, a bright white belly and light grey ears. The coat is smooth in appearance, adding to its eye appeal. This mutation first appeared on a ranch in Rhodesia, South Africa in 1967 and was then sold to a rancher named Loyd Sullivan who developed the mutation into what we are familiar with today. Due to its origins, you will often hear people refer to this coloration as the "afro violet" or the "Sullivan violet" both terms are correct and refer to the same mutation. Today, there are several breeders working to improve this mutation and have brought up their quality considerably. Most notably, in the United Kingdom, is Cameron Holmes with his bevy of gorgeous, large violets that have photos that are regularly featured in news articles and go viral worldwide. In the United States, Brenda Walter has improved this mutation considerably and produced a Grand Show Champion and regularly takes top awards for this mutation. The Ryerson Ranch and Jim Ritterspach also produce high quality animals of these mutations. This mutation is much more complex as it is well known that there are over 7 genes involved in producing this coloration. This mutation is thought to be a cumulative dominant gene meaning that while it is dominant to other colors it also shows up in different shades. 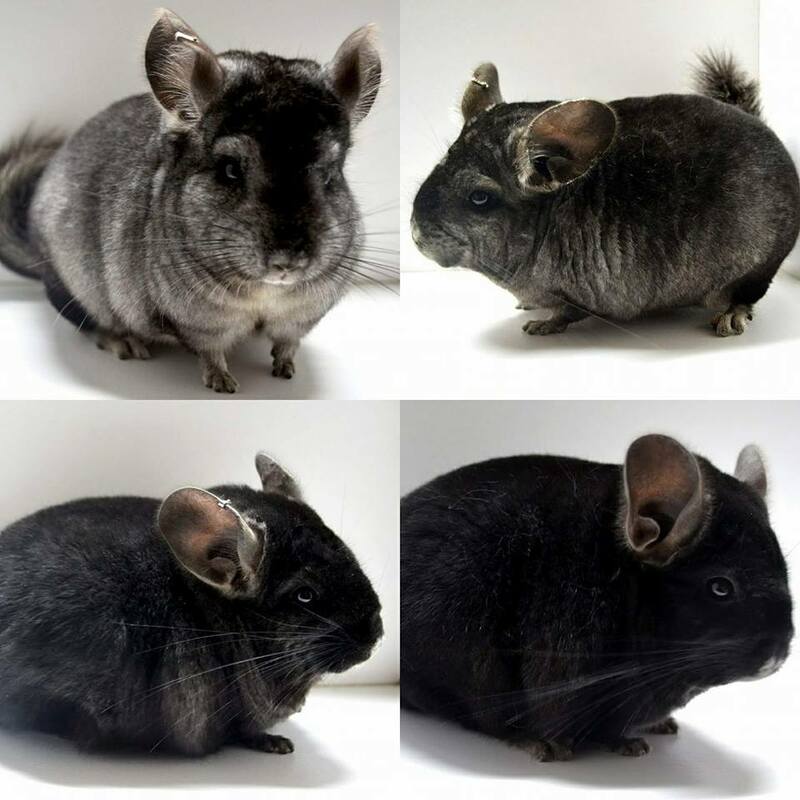 There are five known types and you can read more about the history of the ebony gene and those five types here http://www.edchinchillas.co.uk/ under mutation colors/ dominant/ ebony. The ebony is black with a dark or dirty belly, dark ears, and dark eyes. Due to this very broad description, breeders have put all animals together for breeding that do not show a clear white belly and called them "ebony." 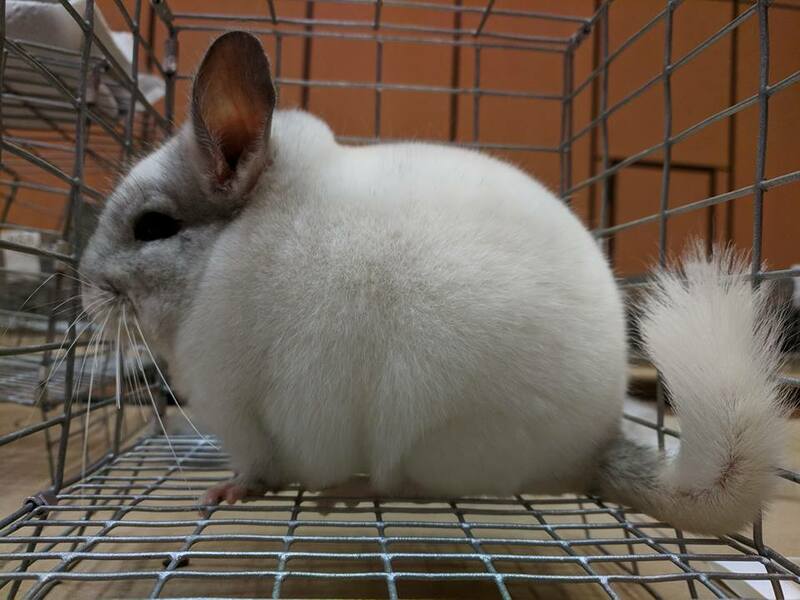 Some breeders that have excellent lines for this mutation are Humble Acres Chinchillas, WK's Designer Chins, and 2nd Chance Chinchilla Ranch. The wilson white is a dominant gene that exhibits a genetic condition known as mosaicism. This means that the mutation is not present in all of the cells of the body. In the cells where it is not present, other colorations will show through such as the standard grey color. Due to the randomization of the mosaicism, it is next to impossible to breed for a particular marking. 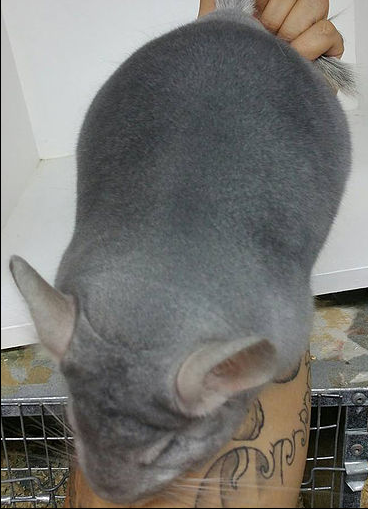 There are occasionally lines where a certain marking appears more often, but chinchillas do not exhibit set markings like horses and dogs due to a lack of proper isolation of these traits. This was the first mutation to appear and was first born on the Blythe Wilson Ranch in Redding, California in 1955. 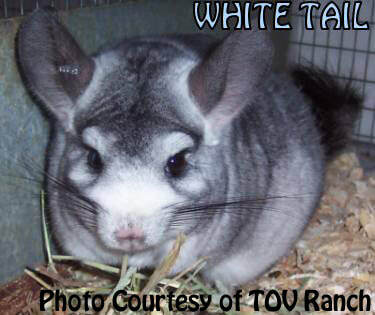 The white gene has been crossed with many other colors including ebony, violet, sapphire, beige, and TOV. The markings on a mosaic vary greatly and people have come up with different ways to describe certain markings that appear more than others. 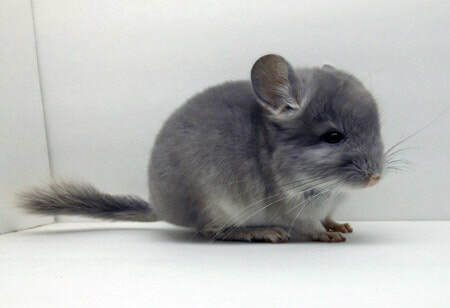 When a chinchilla is frosted with an even coloring of grey and white they are called silver and some that have masks are considered pandas. They are all still wilson white coloration no matter what fancy selling term is given to them. The Gunning black velvet was first developed in 1960 by Bob Gunning of Davenport, Washington. The term "velvet" was given to the Gunning black because it has a velvety knap to the fur and is silky and shimmers when light passes over it. The black velvet is a dominant gene and it is thought that it cannot exist in a homozygous state. Black velvets are extremely blue black in color. The black is evenly veiled across the back and fades to a grey on the sides ending in a clear white belly. 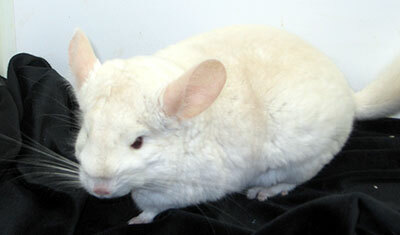 The Tower Beige was developed by Nick Tower in 1955 from a chinchilla bred by Ned Jensen in Oregon. It is a brown/ beige color with a white belly. They have pink ears and pink to reddish-brown eyes. The beige gene is also a dominant gene and the second mutation discovered after the Wilson White. 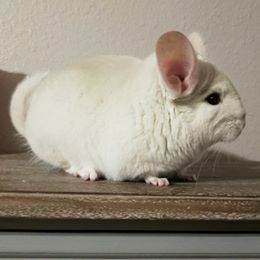 If a chinchilla only carries one copy of this coat color mutation, they are termed heterozygous meaning they have two different copies of the gene. 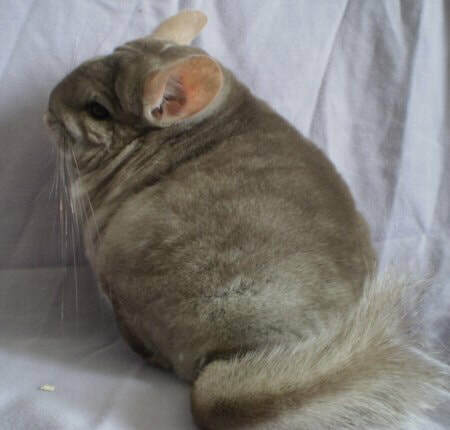 If a chinchilla carries two copies of this coat color mutation (one inherited from the mother and one from the father), they are termed homozygous meaning they have two of the same copies of the gene. This gene is most common as heterozygous which is darker but is also seen in the homozygous form. The heterozygous form is commonly referred to as "Hetero Beige" or simply "Beige" while homozygous beige will be called "Homo Beige". 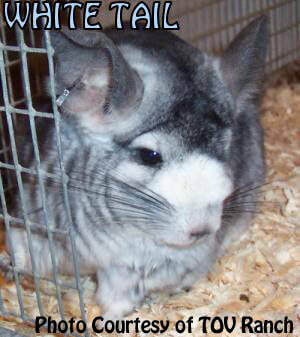 This is one of the newest recessive mutations seen in chinchillas. This mutation is thought to be a recessive beige coat color mutation variant instead of a recessive white coat color mutation variant. This mutation first appeared on the Royal Oaks Ranch in Jamul, California to June and Bob Baar. The first was a female was born on 5/11/95 to two standard animals purchased from Ellis Adcock. Ellis later confirmed that the sire to the Goldbar was from a Doug Wilson line. These chins were white with a light champagne or gold color to them that appeared as a dark gold "bar" down the center of the back, thus leading the Baars to name this mutation the "Goldbar." The Lowe Recessive White first appeared in 2002 in Enderby, B.C., Canada to Robert Lowe's herd. Interestingly, the lines could be traced back to the Wilson herd, though there is no confirmation if the animals that produced the LRW were in any way related to the animals that produced the Goldbar. Cross breedings between these two colors have yielded much evidence that these two mutations are one and the same. However, due to what each line has been crossed to and the higher amount of improvement in the LRW, many breeders still prefer to refer to them as separate mutations to distinguish between the Canadian and American lines and better preserve their genetics. 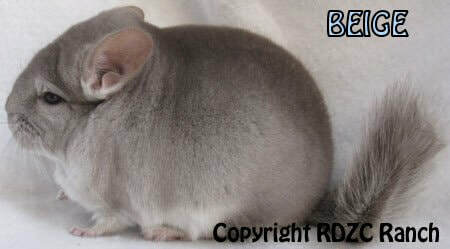 ​First and foremost, we want to stress that this coat color variation is not a recognized mutation color of chinchilla. Breeders who work with this mutation claim that this mutation is a recessive mutation. 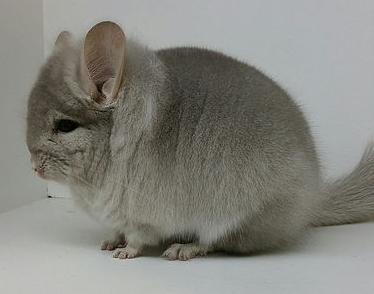 There is strong evidence that this is not a coat color mutation, but in fact an autoimmune disorder that attacks and slowly destroys the pigment cells of the chinchilla as they age. As such, we do not consider this a desirable trait or mutation and are leery of those that continue to persue this mutation. They start out as a standard but when they reach the age of 2 or 3 years they begin to turn white. It starts with white rings around the ears and tail that extend outward to make a mask and white splotches on the hind quarters. 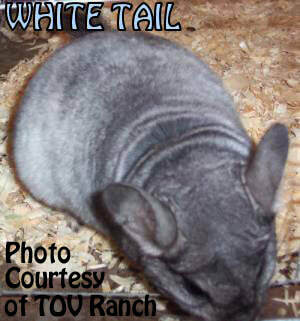 This mutation first appeared on the PSK Ranch in the 1980s and the first animal that exhibited signs of this coloration began fading in a ring around the tail, thus causing Pete and Sue Kiseskey to refer to the variation as the "White Tail." Since their ranch was located in Tehachapi, CA, the variation then picked up the name California White tail. Many breeders incorrectly refer to this as the California Recessive White or the Recessive Fading White. This mutation has not been shown to be a recessive mutation, so the use of that genetic term for this variation is incorrectly applied. ​This color was developed by Lloyd Sullivan. Unlike the Tower beige, a Sullivan beige does not oxidize red but they do turn slightly orange. They have jellybean red eyes. 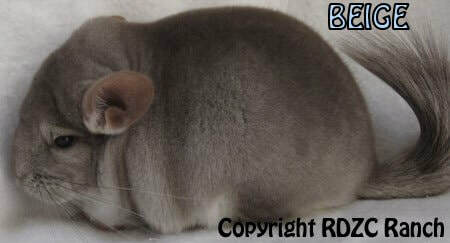 since this is a new mutation they tend to have weak fur and veiling that does not extend completely down their sides. This mutation should not be confused with the Tower beige which is the common beige color that you should be able to find at most hobby breeders. There is no recorded, verified Sullivan beiges still breeding successfully today. One of the last groups of Sullivan beige moved to Arizona where they failed to reproduce a healthy, viable Sullivan beige offspring. 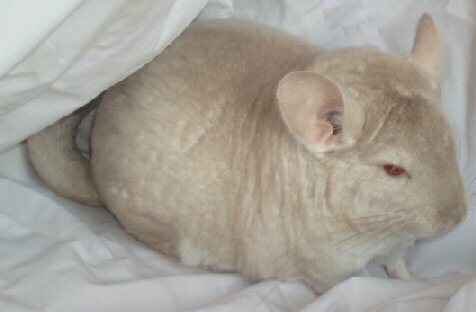 A recessive beige mutation has appeared in California and while some speculate that this may be a reemergence of the Sullivan beige, with no living animals to test this speculation, it remains that the Sullivan beige is potentially extinct like many other recessive mutations that were deemed undesirable. ​The Charcoal is a true recessive ebony-like gene. While the charcoal was first developed here in the United States (mainly in California) it has since been bred deeply into what we know as the ebony mutation and no true strains of charcoal are known to exist in the U.S. today. 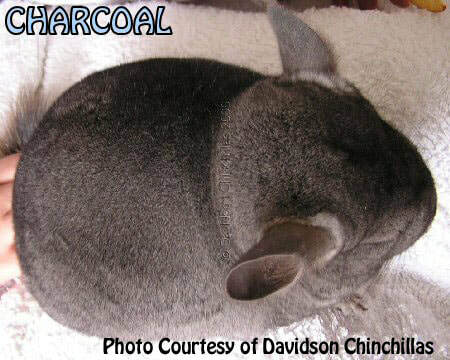 There are a select few breeders in the UK that do still breed pure charcoals. 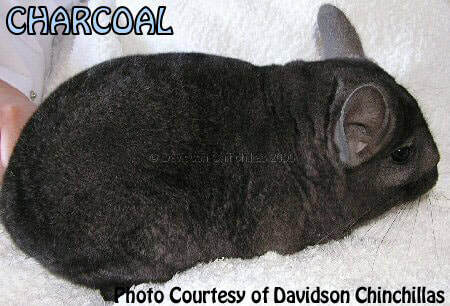 For an in depth look at the background and genetics of the charcoal mutation please visit http://www.davidson-chinchillas.co.uk/pages/charcoal_chinchillas.php. The black pearl mutation is a mutation that was recently introduced into the United States with a select few breeders. This is a recessive color mutation and shows with brown to black eyes, a white belly and all black on top. There is no grey siding as seen in the dominant black velvet mutation. This mutation is still small and has issues with color and belly coloration. As a new mutation this is also a costly mutation to "buy into" and we caution any new breeders to steer clear of a mutation in need of so much development. Photos courtesy of Malwina Kucharczak, Mark Johnson, and Bobbie Schultz. The following two mutations are not coat color mutations, but they are variations on fur type. Each of these can appear across different colors, though the curly mutation as specified below is linked with the ebony gene and cannot appear in animals that are free of any ebony influence. 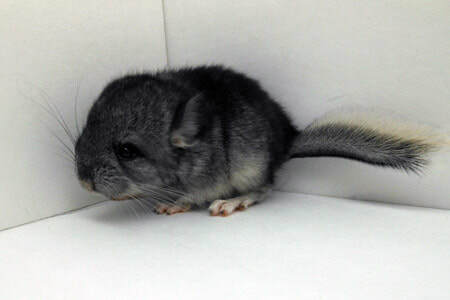 Angoras appear in many of the mutation colors shown above and many are producing them in a rainbow of chinchilla coat colors. 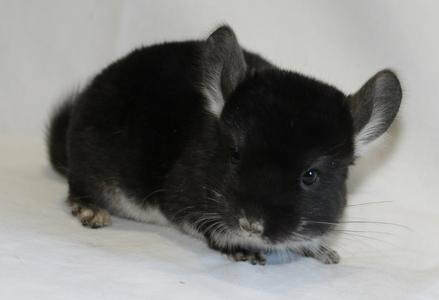 It is best with this developing mutation to stick with the basic coat color combinations while the chinchilla industry works on a set standard for these newest developments in chinchilla breeding. 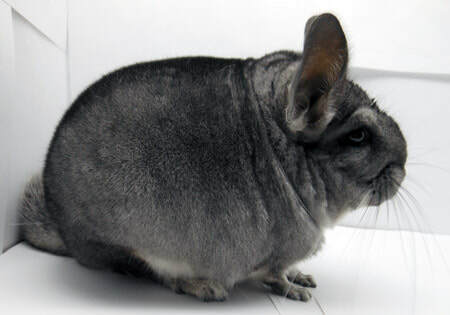 The following description is taken from chinchillas.com at the following URL (http://chinchillas.com/newsletter/Royal-Persian-Angora-Chinchilla-Press-Release.htm), follow the link for more details about this mutation from the developers. Photos courtesy of Jordan Manalo of Manalo Chinchillas.
" The modern Royal Persian Angora mutation of Amarillo appears to be a recessive gene. Most carriers look normal, but a few carriers have slightly longer, plushier hair than non- carriers. 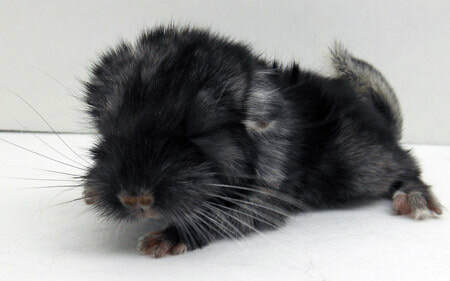 In the homozygous form, the fur is truly that of Angora type. It has also been noted that breeding Angora to Angora sometimes produces offspring with hair longer still than sire and dam. Along with their long silky fur, the modern Royal Persian Angoras also tend to have aesthetically pleasing pretty heads. The Royal Persian Angoras tend to be more diminutive than their agouti and dominant color mutation non-Angora counterparts. 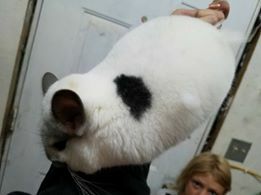 Fur length in a normal chinchilla averages 3/4 - 1 inch over the neck, and 1-1 1/2 inches over the rear. In the Royal Persian Angoras, however, fur lengths reach 1 3/4 over the neck, and up to 2-3 inches over the rear. Unlike the long haired chinchillas of the 1960's, today's Angoras are not afflicted with the significant off color of their progenitors. They do not, however, mature rapidly as was noted in earlier herds. 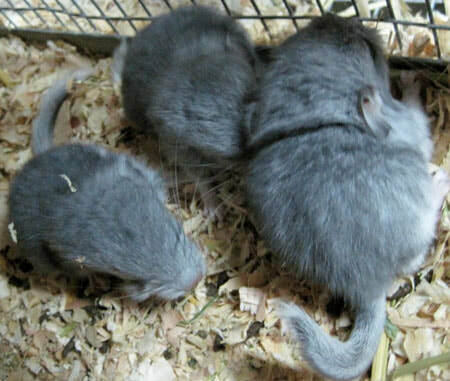 Today's Royal Persian Angoras mature at rates similar to non Angora chinchillas." 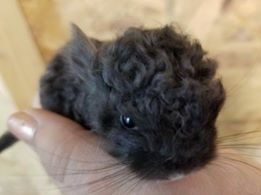 ​The following description is taken from chinchillas.com at the following URL (http://www.chinchillas.com/locken/about_the_locken_curly_chinchilla_mutation.htm), follow the link for more details about this mutation from the developers. 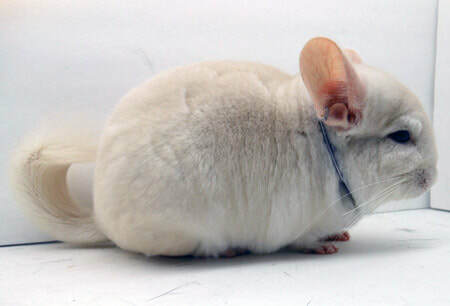 The following single mutation is a body type mutation in chinchillas. 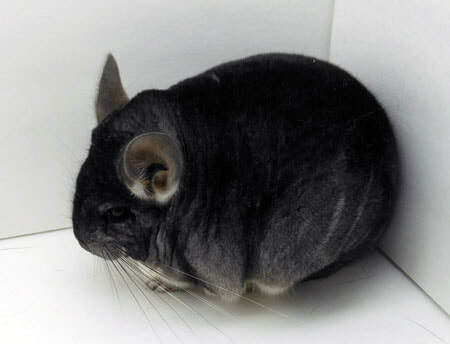 Just as in humans or other species of mammals, there are many types of body mutations in chinchillas. 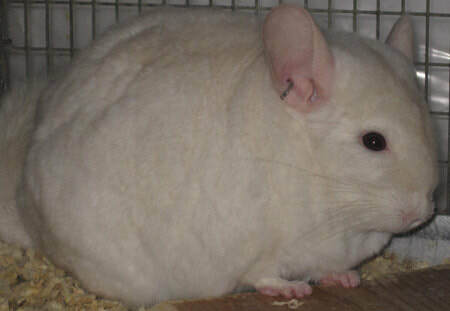 Examples of gigantism in chinchillas typically results in early death. 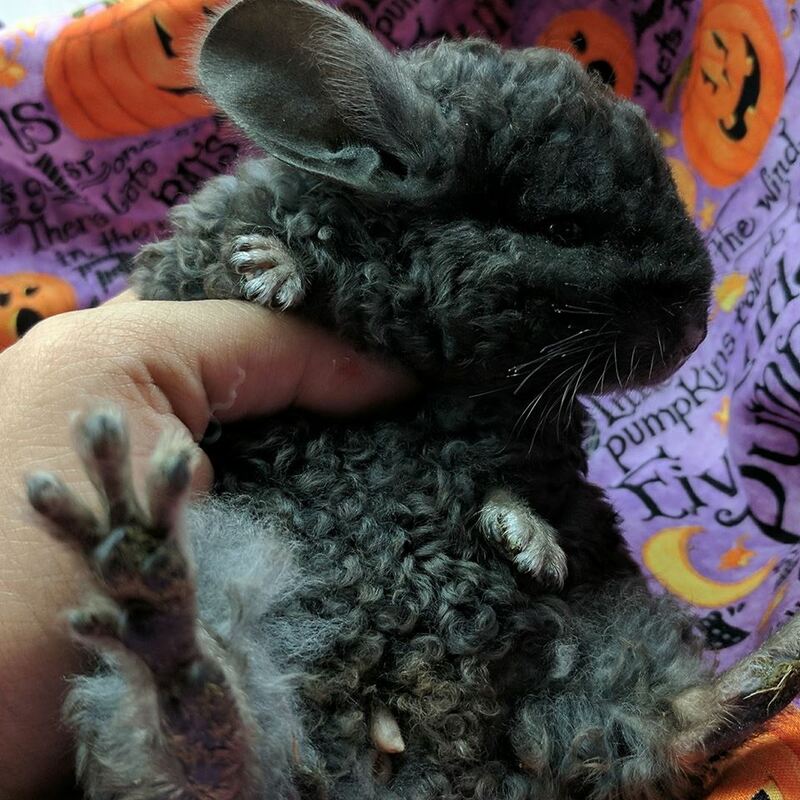 When growth is not monitored properly in the body and causes a chinchilla to grow to above average size rapidly (before the age of 6 months) this means that other body growths such as the teeth are not being regulated properly. 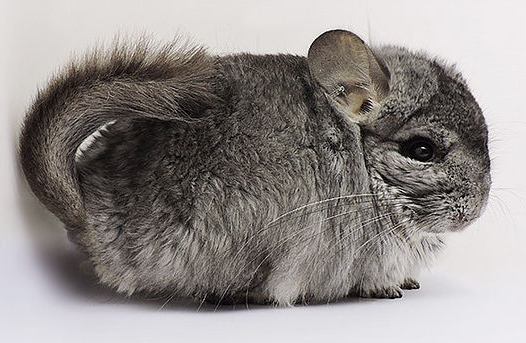 Most chinchillas exhibiting gigantism will pass early due to irregular teeth growth (malocclusion) that will interfere with their ability to eat and thrive naturally. Below is listed the only known body modification that has been shown to pass on as a breedable trait to offspring. This mutation exhibits itself in a shortened, smaller body stature, shortened stubby legs, and a shortened. larger head. 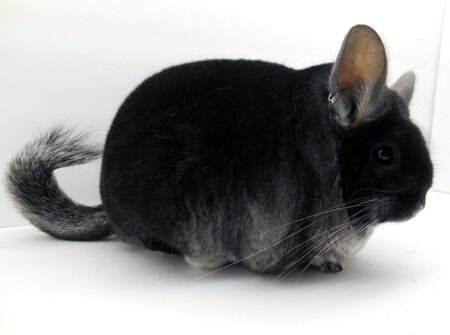 Chinchillas that are true dwarves will show many physical abnormalities and will not be able to jump properly. The adult size of a dwarf ranges from 300-450g and females of this mutation are unable to safely birth kits. 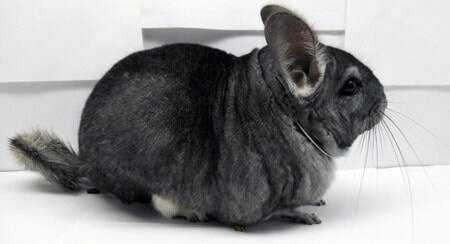 While true dwarves do not exhibit health defects, they do tend to live on the shorter age range of chinchillas (10-15years). 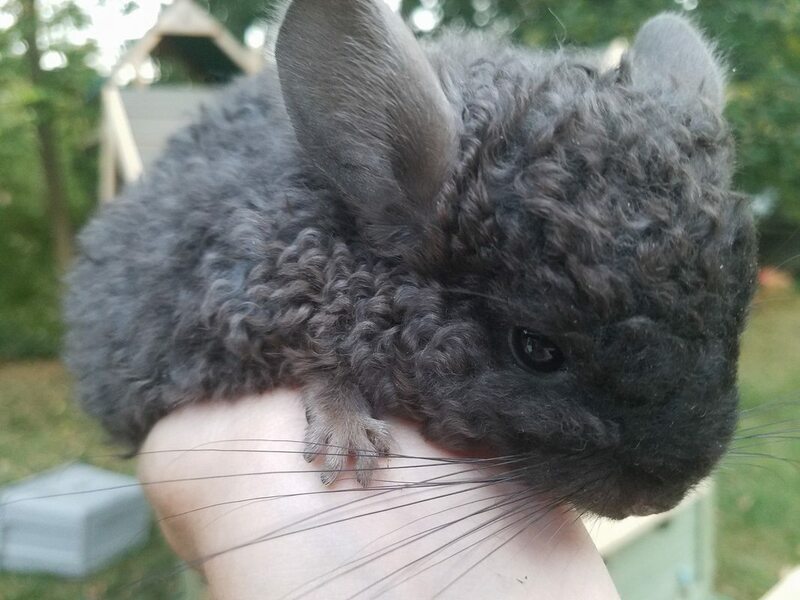 While this mutation is often considered very cute and desirable on the pet market, reputable breeders do not actively breed for this trait. 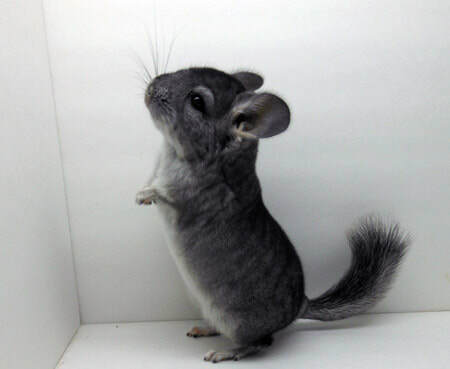 With any dwarfism in species comes health issues and a dwarf chinchilla is entirely made up of traits that go against the quality standard of the chinchilla. Every herd will occasionally have a dwarf born in them, but a responsible breeder will separate the pair or remove one or both parents from breeding to prevent further breeding of this disorder. 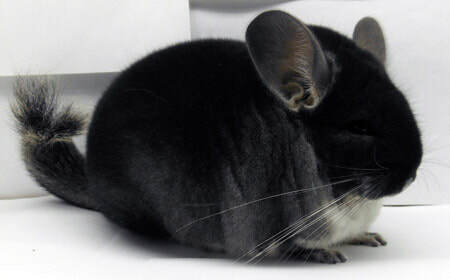 This mutation should not be confused with small chinchillas. 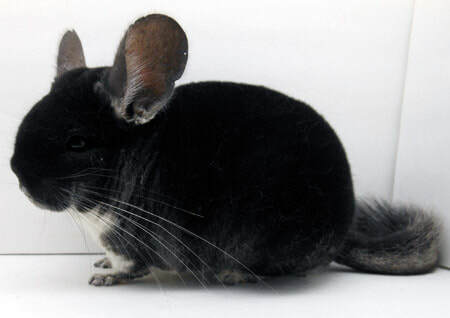 Some chinchillas that are poorly bred can reach an adult size of only 400-500g and while they are small, they do not exhibit the same physical features as a dwarf. 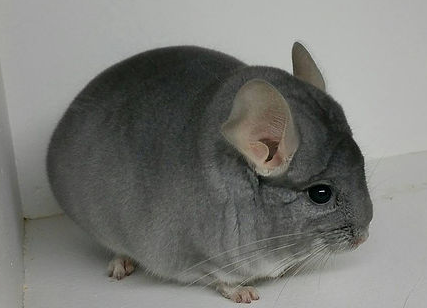 If you are unsure if your animal could be a dwarf or not, contact a reputable breeder for advice.